in any solution you want. 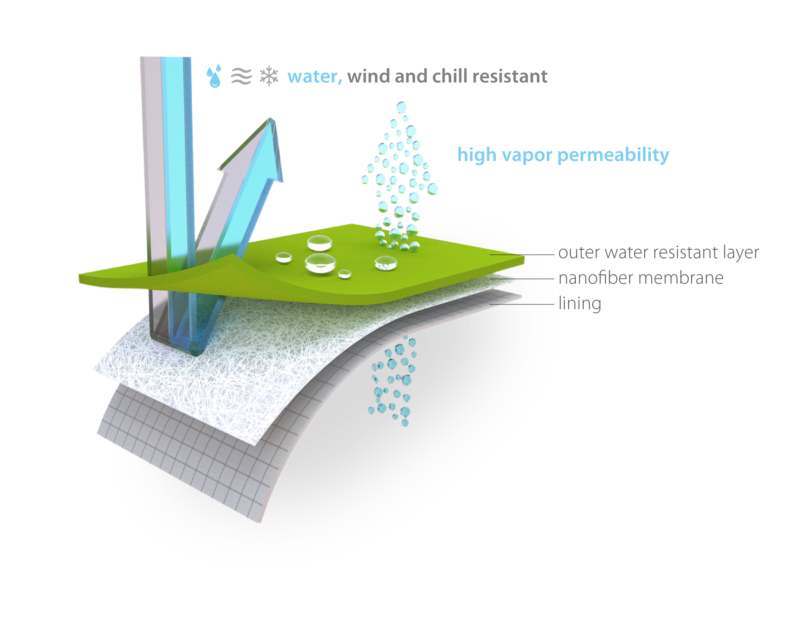 RESPILON® apparel membrane has extreme permeability with MVTR 60 000 g/m2/24h and RET 1,6. The stretchability is 40% better than other outdoor membranes in 4 ways. WE GUARANTEE THE BEST PERFORMANCE. Our nanofiber laminated membrane is currently the best solution on the market that you can use for your products to increase its feature. Looking for the best outdoor membrane? KEEP YOU DRY ALL THE TIME. The temperature of the body stays constant. Clothes are perfectly adapted to activity. Sweat goes away, rain stays out. All this is possible because of nanofibers. A molecule of vapor is small enough to get out of nanofiber web but a molecule of water is too big to get inside. was developed to be used in extreme situations to protect people from external influences. The best properties are its breathability and stretchability. This outdoor membrane provides protection from wind and rain while it can be applicated to all the materials as softshell, hardshell and noiseless textiles. Choose your own application. RESPILON® apparel membrane can be engineered for your needs and will always have a better performance for users.